The new Trails to Trains exhibit at Meadowcroft Rockshelter and Historic Village transports visitors through time, exploring the evolution of transportation in Southwestern Pennsylvania using five vehicles from the collection. Beginning with our early prehistoric predecessors as they navigated Western Pennsylvania’s rugged hill-scape on foot, Cross Creek provided an easy route traveling between the Ohio River and the interior of Western Pennsylvania. Sixteen thousand years ago, prehistoric people navigated this route, saw the Rockshelter, and recognized that it provided an ideal place to camp. The earliest vehicle found in the exhibit is a Conestoga wagon built in 1837 for Alfred Dunlap in Cadiz, Ohio by wagon maker Samuel Amspoker. 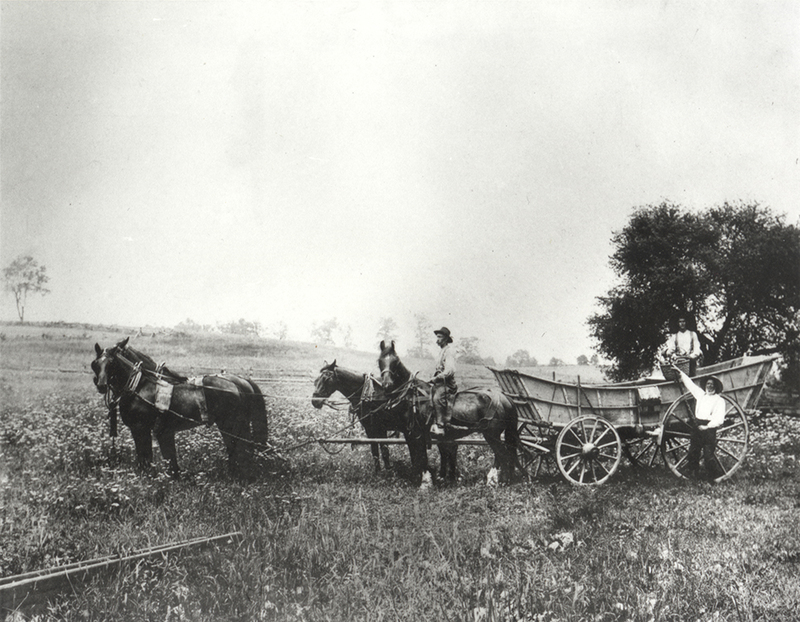 The Conestoga wagon was designed to transport heavy loads of freight over mountainous terrain. The vehicle was named after the Conestoga River Valley in Lancaster County where the wagons were first produced. A Conestoga wagon in a field in Washington County, Pa.
A stagecoach rolling through a town in Washington County, Pa. 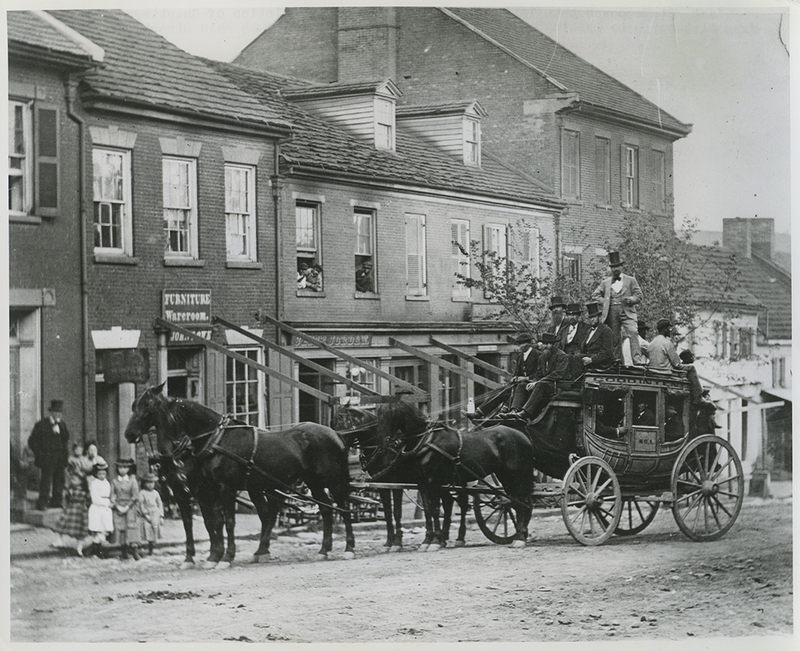 This 19th century vehicle – the Concord Coach – is a legend in American transportation history. The durable design of the coach allowed it to make repeated trips over rugged and mountainous terrain while being driven at the fastest possible speeds. 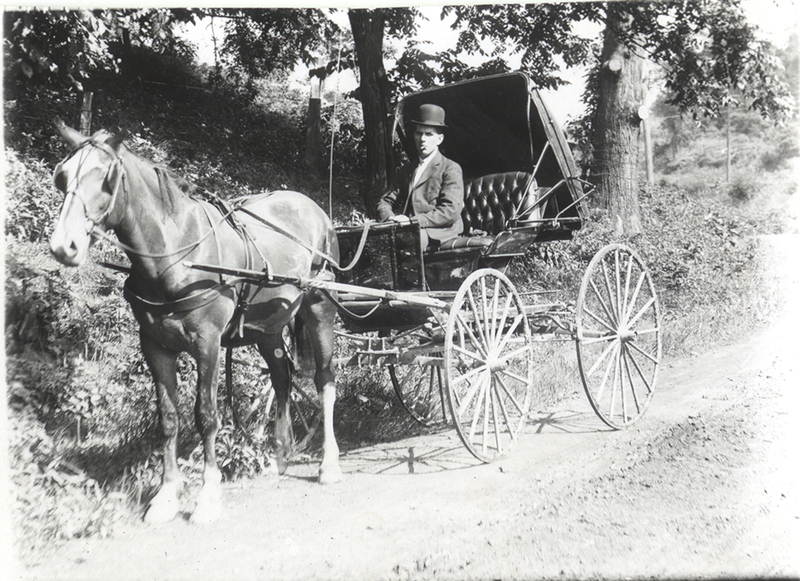 During the 19th century, stagecoach lines ran throughout Western Pennsylvania, providing both transportation and mail service. The first stage line in Western Pennsylvania operated on the National Road and was established by James Kinkead, Jacob Sides, and Abraham Russell in 1818. This line was joined a year later by a Washington to Pittsburgh route established by Kinkead and D.H. Blaine. Buggy manufacturers and distributors, such as the Washington Buggy Company, provided residents with stylish vehicles, such as the top buggy which had a buckboard suspension, greatly improving the ride. The buggy below was sold by the Washington Buggy Company, located at 37 West Maiden Street, Washington, Pa., around the turn of the 20th century. By 1876, railroads were found in cities and small towns across America which brought about revolutionary change in economic and personal mobility. 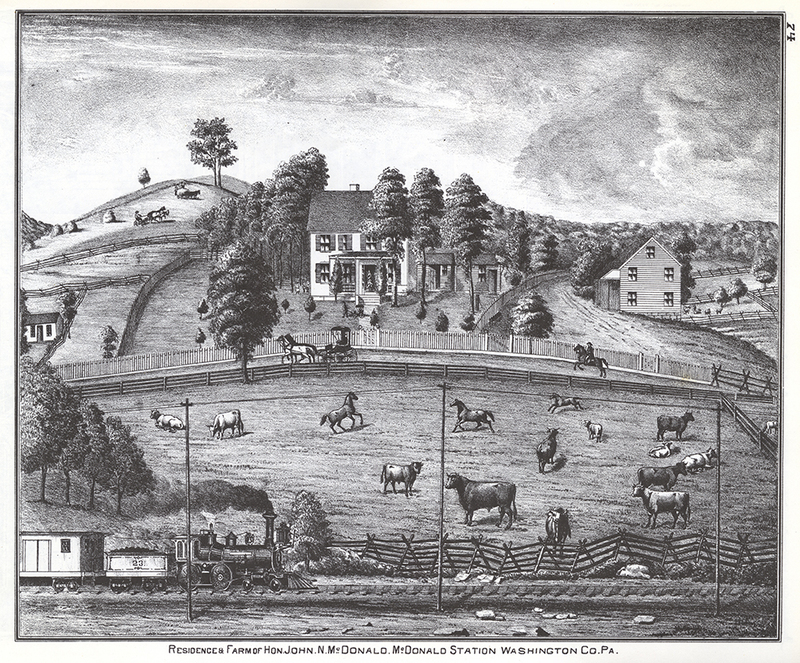 The development of early mass transportation, built across the rough terrain of Western Pennsylvania, crossed through many farms as seen in the below rendering from Caldwell’s Atlas. Goods and people could now travel across the United States in a fraction of the time. Buggy sold by the Washington Buggy Company out of Washington County, Pa. Rendering of the McDonald Farm, Washington County, Pa., from Caldwell's Atlas. Bonnie Reese, Ph.D. is the curator at Meadowcroft Rockshelter and Historic Village.